It might have turned out differently. Beethoven completed the Fifth in 1808, but in a sketchbook from 1804 he tried out several different ideas for its conclusion. Six bars of one discarded sketch prefigured a movement that would begin softly and, wrote Beethoven, “could close at the very end with a march.” Another idea envisioned a finale in 6/8 time (rather than simple and direct 4/4) that would retain the C minor of the first and third movements. Whatever its merits, such an ending would have deprived the listener of the jubilant switch to the major tonality that so perfectly completes the work. The greatest of symphonies did not, in other words, spring fully formed from the maestro’s head. It was the product of careful thought and planning: of ideas considered, refined and rejected. As the master composers fade into history, it is worth remembering that their business—divinely inspired or not—was first of all work. Beethoven personifies this simple truth. His life was one long struggle to bring music into being through force of will. A constant sufferer who never found love and slowly lost the ability to hear his own creations, he considered suicide but pressed on in the name of art. Piecing together the evidence and watching him work is an inspiring lesson in human resilience. The evidence in question is Beethoven’s sketchbooks, many of which have yet to be fully transcribed or explored. Mr. Lockwood has a special expertise in the so-called Eroica sketchbook, covering the years 1803-04, and he draws upon the work of scholars who have combed through others. 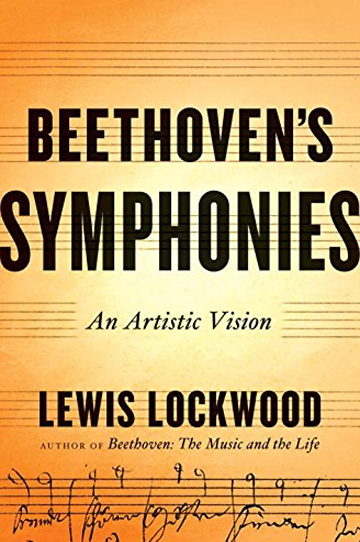 Mr. Lockwood’s “Beethoven’s Symphonies: An Artistic Vision” is both a collection of critical essays on each of the nine masterworks and a fascinating exploration of their provenance. Elegant, learned, endlessly enthusiastic yet critically incisive, “Beethoven’s Symphonies” is an outstanding single-volume appreciation of the composer’s orchestral creations. Beethoven’s listeners have often commented on the odd-even problem. The composer made his greatest contributions to the symphonic literature in numbers Three, Five, Seven and Nine, writing more limited, conservative works in between. Without gainsaying this pattern, Mr. Lockwood makes a special defense of the unloved evens. He notes that the Third has unfairly overshadowed number Two, in which Beethoven broke free of Mozart and Haydn’s polite restraint and wrote some lovely slow music as well. (“The Larghetto is a gem of the first water.”) In the Eighth, Beethoven wielded a rapier rather than a hammer, Mr. Lockwood writes, adopting the conventions of the classical symphony but making them his own. In addition to jotting down musical ideas, Beethoven used his sketchbooks to argue with himself. For instance, he struggled to find the right subtitle for the Sixth Symphony (“Pastoral”). The Sixth was his only serious foray into program music, which seeks to depict the natural world directly. In this case, the scene was country life, complete with bird calls, hoedown, babbling brook and storm. Yet program music was the pops of the 19th century, and Beethoven did not want to come across as a lightweight. In his sketchbook, he tried out various ways of characterizing the work: “One leaves it to the listener to discover the situations”; “Each act of tone-painting, as soon as it is pushed too far in instrumental music, loses its force”; and “Whoever has any idea of country life can imagine for himself what the composer has in mind without a great many titles.” These wordy apologias underline his second thoughts about the whole project. Mr. Lockwood has a special fondness for the Seventh Symphony: the most rhythmically striking of the nine. “It is no surprise that this symphony became a favorite for choreographers,” he writes. Here Mr. Lockwood’s expertise comes into play. The secret of the Seventh is not something technical out of music-theory class—Beethoven’s voice leading or his use of quasi-melodic motifs, for example. It is simple proportion. “The Seventh is one of the most fully satisfying of all Beethoven’s works,” Mr. Lockwood writes, because “everything that is in it contributes equally to the quality of the whole.” The sketchbooks reveal that the Seventh, like the Fifth, might have had a different final movement, a draft that Mr. Lockwood dismisses as “naïve and square-cut.” Instead Beethoven discovered an exuberant, rhythmic, dizzyingly onrushing finale, one that unifies the work and sends the listener from the concert hall full of new purpose. “Beethoven’s Symphonies” ends, as it must, with the Ninth (“Choral”), the mighty giant that dwarfed all that had come before it—from Beethoven or anyone else. It is a fitting capstone for a book about the composer at work. The symphony’s first bars—with their open fifths in the strings that sound for all the world like an orchestra tuning—are Beethoven’s statement of “the process of composition itself, from premonition to embodiment.” As the symphony reaches its extraordinary conclusion with a choral setting of Schiller’s “Ode to Joy,” the listener perceives anew what a great gift we have in Beethoven. This music never grows old—and, enjoyed alongside Mr. Lockwood’s expert commentary, it sparkles with fresh magic.